Armageddon Chess is a relatively recent phenomenon, but I’m not sure exactly who invented it. The concept is this: the game must produce a decisive result. Black has draw odds, and to compensate this White has extra time. It is often used in knockout tournaments as a “tiebreak of last resort”, if the players cannot be split by a series of tiebreak games with shorter and shorter time controls. 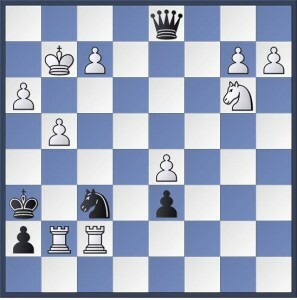 In this case usually White has 6 minutes to Black’s 5, or perhaps 5 v 4. It has even appeared in the World Championship regulations. While this might sound like a ridiculous way to decide a World Championship match (it is), there have been plenty of examples of worse. The most famous is probably the Smyslov-Hubner Candidates quarter final in 1983 being decided by the roll of the roulette ball (although the ball landed on zero first time!). A few years ago the US Championship introduced Armageddon into their event, albeit with a twist. After 8 rounds of a normal Swiss, the top 4 players would qualify for the Armageddon playoff, with 2 semis and a final. The time control was slightly different, with White having a fixed time (of say 30 minutes – I can’t recall the exact details) and players ‘bidding’ for the Black pieces. The player with the lowest bid would ‘win’ the Black pieces and draw odds, but would start the game with their bid against White’s full allocation. Edinburgh Chess Club member David Oswald has organised 2 similar Weekend events at the club – the so-called Elite Armageddon events. After a 4 round Swiss, players are split into groups of 4 according to finishing places to play a semi-final and final/ playoff (although most of the prizes are for the top group only). Here White has 45 minutes to start with. There has been a huge variance in strategy, with a number of players bidding 45 minutes to secure White, right down to the bidding style of Andrew “the 14 minute man” Green. My own preference has been somewhere in the middle. I had the opportunity to ask a couple of the strongest players on the planet (!) after the Scottish Blitz this year what they might bid. Their verdict was that it would hugely depend on the situation and how you were feeling at that moment. Or they were sitting on the fence! Both events have been won by Alan Tate of Wandering Dragons. Alan is generally one of the 45 minute bidders (although he did go a bit lower against me in the final of the first event). In the final of the second against GM Keti Arakhamia-Grant both players bid 45 minutes! In this case, the rules allow for one resubmission should players wish to alter their bid. Again, both players bid 45 minutes. There was then a coin toss to decide who was to get White. This got me thinking. If both players wanted White and bid 45 minutes, then why not reverse the auction? So for the second bid, players would bid for White. Would the players actually be willing to take less time and give draw odds just for the White pieces? Food for thought. Black played 1…Nxg4, and after 2.Rxh7+ Kg6 3.Rhg7+ Kh6 the move 4.hxg4?? allowed Black to draw immediately with 4…Qh1+! 5.Kg3 Qg2+! 6.Kf4 Qf3+! 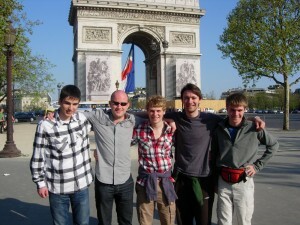 4 club members were in a 6 player group of Scots that played in the 9th Malakoff Open in Paris in April. Due to a certain volcano disturbing our travel plans, the Scots arrived late and were paired against each other! A further derby match Berry v Oswald took place in round 5. Andrew Green took the scalp of Kozhuharov (2419) to round off a fine tournament on 6/9. Neil Berry also scored 6. David Oswald won the under 2000 Grading Performance Prize with his score of 5.5. Clement Sreeves scored 4.5.